But she played Clue, and she's watched 5,000 movies and TV shows. Ethel knows the murder-mystery arc: discovery, investigation, revelation. That's why she attends murder parties - and theatrical whodunits like Shear Madness (the longest-running off-Broadway play in American history, where the audience gets to solve the crime eight times a week) - and mystery weekend vacations. And it's why, sometimes, Aunt Ethel starts a web business selling murder games. The lesson, then, these Pod Gamers can teach us: Even normal people can become gamers if they understand the script. "Duh," you say? Not so, your "duh"! Within this lesson lie unexploited market opportunities. Soap operas: Everyone knows how they work, even people who have never watched The Guiding Light or Eastenders or, nowadays, a dozen Korean tearjerkers. Reality shows: If you can host a murder mystery, why not Survivor or The Apprentice? Fantasy: No, listen. Standard D&D/WoW/EQ/Diku MUD fantasylands are still foreign to Aunt Ethel, but she probably knows Peter Jackson's Lord of the Rings movies. The opportunity, as yet unexploited, is a script that uses exactly what she knows and no more. How to Host a Shire Birthday Party, anyone? Alternate reality games (ARGs) like ilovebees and Last Call Poker prove an online experience can send players into the physical world looking for payphones or cemeteries. Many games could use similar event planning. Party games don't scale. They work for six to 10 guests, or up to 200 at corporate functions. But the individual event doesn't have to scale, only the number of events. 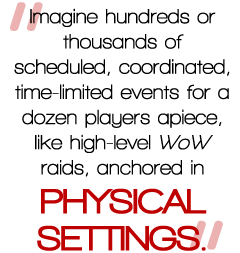 Imagine hundreds or thousands of scheduled, coordinated, time-limited events for a dozen players apiece, like high-level WoW raids, anchored in physical settings. No, players wouldn't dress like Sally the flapper and eat a four-course dinner, but they could gather to accomplish an online task. Suppose you could arrange a promotion with Starbucks: Have players coordinate to visit a nearby branch at 2:00 p.m. on Saturday, order something and tell the barista their promotion code. Then poll the Starbucks data and coordinate their actions in the game based on their orders. Too crazy? Maybe. The point is to encourage players to arrange a shared, structured real-world experience so simple, so direct, even Aunt Ethel could do it. Party games will be with us always. Even if we eventually play online with Teamspeak-enabled VR headsets and full-body force-feedback haptics, we'll still want the face time, the prana of human proximity. The insights offered by murder party games still hold their place, and can help us reach a broader audience. Possibly we want that, but maybe not. Still, like party guests, we should at least investigate the clues to see where they may lead.